You can split in the field. See an opportunity to split your tanks and envelop the enemy - then you can do it. But you need to be able to survive the attempted break out. Woah, so the developer finally succumbed to the relentless demand for updates from the existing fanbase. Good, looking forward to future ones! lol Not quite. There's been a marketting plan for some time but the materials weren't ready and the initial announcement was, with hindsight, made too early. Our mistake. The last year or so hasn't gone quite to plan with a number of us needing to split our time between multiple projects ( the reality of developing niche games ) and a couple of essential system changes that required a reset. There's really been nothing we could of talked about or shown that would of been of any interest to anyone. Thats just the way it goes sometimes. So the forum has not been upmost on our minds. Definitely our bad and we hope to do better over the coming months. No, we've never stopped development and finishing the game has never been in question. Yes, we have collated many of the comments and suggestions. I'd say 'all of them' but some of them are utter pants. You need to do better! Yes, we appreciate gifts of cakes. And thank you Alberto and zakblood. Last edited by Patrick Ward on Sat Jul 21, 2018 7:28 pm, edited 1 time in total. I think a good game is a game mechanics + visual design. Not one thing. Two together. It is worth to evaluate two things together. If there is a map converter, will there be a full scenario converter? If so, will all existing PZC1 content(DLC, GC) be transferred into a new game engine? I would also like to know more about the campaign. Will these be completely new scenarios? All in good time matey. More dev diaries have been and are being written and I don't want to jump the gun on anything. Just to squash one rumour before it spreads ... to the best of my knowledge there will not be a conversion tool and the PzC1 maps will not come pre-converted. I might be wrong but for now, assume that there isn't and they won't. Thanks for all the feedback so far. Rest assured that we are listening very carefully, and no comment will go unnoticed. From the Map-Depiction, my first impression is that the Units in it with the depicted BackGround just might blend together a little too much, making it difficult to see where your Units' are verses the Campaign/Scenario-Map!. Would it be possible to have a built-In-adjustment tab or what-ever, so that one could adjust the intensity of the Darkness/Brightness of the Units and or also the BackGround-Scenery?...to make it easier for the Player to see what is going on and to easily see who is where and in what terrain situation!. The units always stood out from the map in this game series, and this is one of our priorities in the new game. The screenshot may not be fully representative here, because in trying to show more of the map at once, I've got view angle close to top-down, which makes it harder to read the units. To make matters worse, this screenshot was downscaled from full HD (BTW, here is the image in original size). In any event, if our current implementation is not good enough, we will improve it. Of course, we can make an option to control intensity of units/terrain, but first, we will try to make it work for everybody and without the need to adjust anything. But even before you can test them, feel free to post any concerns here! For example, splitting sounds interesting, but it pretty much goes against all the rules of good combat. You should always consolidate strength, not spread it, especially in long PVE campaign environments where snowball effects make winner win more and losers lose more. Is it actually going to be effective general tactic, or a gimmick that requires specific scenario design to enable functionality of? I mean, if splitting a unit takes extra core slots, why not just have full normal core slots of cheaper units and have them all proper 10 strength instead of expensive 5 strength units. It's generally always better to have weaker 10 strengths than stronger 5 strengths. This is why all those custom maps with 1 and 2 strength Tiger tanks units were interesting in concept, but invariably failed in practice. - A unit may take up several slots, so splitting may be cheaper than buying a second full-blown unit. - There are also over-strength units, so even in halves they can be quite powerful (e. g. 15 -> 8+7). - You can split/merge on one side of the map when you need an additional unit there, then do it on the other side of the map next turn. It just makes your force more flexible, at a cost of leaving some slots unused. Panzer Corps 2 is a turn based game, so it does not need to multi-thread as aggressively as real time games. However, the AI has been designed and implemented so that it can use as many threads as we throw at it, so it should be able to utilize all available cores. In the end, relative size of units will be handled the same way it was handled in Panzer Corps. I don't remember any complaints about unit relative scaling in that game, but if you think it is not good enough, let us know! The graphics do nothing at all for me, they're bland exhibit "early 21st century 3D render style", which is to say no style at all. I can't see that these graphics justify the shift to 3D. Unity of Command 2 team is doing a far better job producing a coherent and interesting visual style for their new game (even in 3D). I hate zooming and rotating around a map with a camera, it feels like camera is used as a crutch for bad graphic design. I'd rather have things presented well in max 2 scales, or better yet 1 scale with a mini-map. 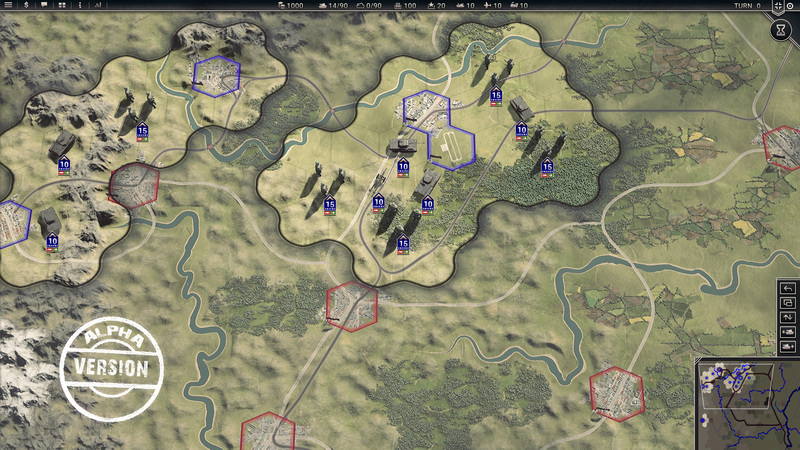 I agree that Unity of Command 2 looks quite nice, but I don't agree that Panzer Corps 2 has no style. I think, "Panzer" games in 2D had very distinctive visual style, and the new game very clearly follows the same style in 3D. You may not like it, but it does not mean it is not there. As for camera controls, they will not be more complicated than in Panzer Corps. At the same time, personally I think that smooth zoom is always an advantage. In this game every battle has many different levels, starting from global strategy to strategy of each separate battle group to low-level tactics. You need different scale when planning ground war, air war and naval war. In each case you will use zoom to see everything you need big and clear. I don't like the captured units mechanic at all. I know people liked using Char B1s etc. in PC, but the truth is that too much captured equipment makes the armies feel less unique, breaks immersion and encourages lazy play. I'd like to see less captured equipment, not more. The point of captured unit mechanic is to have LESS captured units, not more. The way it worked before, when you got your Char B1s, you could use it indefinitely, until a more powerful upgrade became available. In Panzer Corps 2 you spend points from captured pool to raise such units, and also to replace them. As soon as you run out of points, no further replacements are possible. You can either try to capture more points form the enemy, or upgrade this unit to your native equipment, to get unlimited replacement points. I'm keen to see what devs make of the whole prestige system / power curve / campaign progression. This to my mind is where the game will be made or broken, and I do hope there is some serious innovation in the works. I did not write about it in the first diary, because it is more of a low-level aspect, related to how rules and formulas work under the hood. All I can say is that we are of course aware of the problem and giving it a lot of attention. It could be a good subject for one of the future dev diaries. I think, even from the first dev diary it is obvious that we are doing some pretty serious changes, which some Panzer Corps fans may not like. In fact, with an established game like Panzer Corps, ANY change is risky. As for classes and stats - well, we don't change them simply because it is better to add more functionality via unit's unique traits and abilities than to introduce more stats which most units may not even need. At the same time, it is good to give our players some familiar ground and not force them to learn the whole game from scratch. This is what sequels are about. In that game air units were not proper core units though, but "air missions". We thought it was important to keep air units in the core, so you could nurture them, replace/elite-replace/upgrade/over-strength them, use prototypes or captured equipment for them, gain experience, awards and heroes on them, and even... give them unique names. In other words, do everything you are used to do with your beloved core units. We don't plan to provide any official conversions of PzC content. PzC2 is a new, separate game. If there is demand, it is technically possible to provide conversion option as part of the new Editor. However, note that Panzer Corps 2 uses a different hex orientation, so any maps from Panzer Corps will be converted rotated. And of course, the balance of such converted scenarios will be completely off, because of different game rules, different unit balance, different AI and many other aspects. hated this feature in Panzer General 2 because it makes squishy units much less viable. The thing I like about OOB is that there are viable strategies which use weak units like engineers. This provides unnecessary complexity and potential to be exploited. It also makes balancing scenarios more difficult. Doesn't work well will above mentioned Overrun mechanic. While I like using captured units in the campaign, these are carefully balanced. Having this as a core mechanic can be a nightmare from scenario designer point of view. Hated this in Panzer General 3. Once again this makes the balancing of the campaign a nightmare because if these abilities are actually good you may end up with overpowered units. I thought that they would learn their lesson from overpowered leaders in PC 1 that had to be banned in a patch. The description of the feature is quite vague to comment on but overall PC 2 really needs more focus on Air and Naval warfare. I always thought that Air and Naval Warfare in PC 1 was just an afterthought. Overall, I'm not impressed, but there is still plenty of information that we don't know about the game so I will keep an eye out for new features . - will the dreaded overstrength mechanic be present? - will the command slots be kept without any wights? (I mean in PC each unit takes up one slot, in OOB infantry takes 3, heavy infantry 4, light tank 5, medium tank 6, heavy tank 7 which makes more srtategies viable). Im not into splitting units, butif it is considered than I do hope that strengthening units in between turns will also be changed from forced back to full strength to 1-by-1. New gameplay adaptations sound good! However, the Alpha version graphics look much less to be desired!! All sound very intriguing on paper, we'll see though! There was a good point brought up about overrun interaction with intentionally split and therefore under strength units... Sounds like there could, and should, be an interesting and dynamic relationship to those mechanics. Splitting should always be a good and powerful tool to employ, for the variety of reasons you've laid out, and it should not be just a scenario design gimmick. But overrun is what keeps an otherwise OP ability in check. Easy to overrun a scattering of formations, and protecting yourself from overrun requires concentration of force and not splitting. Don't like the greenish look, hope you add more colors to the game. Thanks for developing PC2! - I saw the diary - announcement but I do wonder if terrain will play a bigger part in the outcome of battles. In Panzer Corps I. terrain types dont play a roll (besides rivers, bridges and wheater as such), but terraine influence is what I am really missing in the title! It does ? Infantry gets a huge bonus in closed terrain, for example. I played the serie since panzer general 1 and I can't wait to see this new legend come to life! I hope the units prices will be calculated better this time according to there power and utility. You must use a more progressive scale IMHO. DandyDust, no, it is not due to entrenchment but due to "close combat" feature of many terrain hexes that trigger the "Close Defense" stat for non-infantry units. You should probably read the PZC manual. Well, even a quick capture of empty cities. I hope AI will also be able to use these opportunities. It works like this: when a group of units is encircled by the enemy (only “passable” terrain needs to be blocked), it no longer receives any supply, and on top of this, encircled units will get a progressive combat penalty every turn. In the screenshot, we do not see if the friendly airfield is participating in the blockade or everything is done by the infantry unit. Full encirclement. Blocked all available escape routes. If the unit is suppressed, it surrenders. The unit receives a full penalty. When a unit falls into the enemy ZOC. There is no dense circle. The unit can still break through the encirclement. But if he does not, on the next turn he will begin to receive half the penalties. But since we saw in the screenshot that there will be resources/supply points. That strategic encirclement can be made by cutting supply lines by capturing/destroying supply hubs (resource-generated hexes). Having all this it would be nice to have the opportunity and the game mechanics to somehow influence and help the blocked units. For this can use transport ships and aircraft. Having given them the opportunity to start empty and carry "supplies" for the blocked units or the encircled region. When they are above the unit or next to the encircled region the unit disappears and the blocked units receive a freeze/decrease/reset of the penalty.